We here at LGRAB get a lot of questions about which bike bags we use and recommend. Over the years, I have accumulated quite a collection! I’m constantly switching from bag to bag – usually between my two Po Campo panniers, my regular purse and canvas shopping bags. In this video, I go through my entire collection and discuss which styles I like best. I figure this post will be a resource for new bicyclists searching for ideas about how to carry stuff on their bikes, so please share your bike bag recommendations in the comments. P.S. For more info on my bicycle, see my Rivendell Betty Foy video. Also, my bungie straps and Po Campo review. 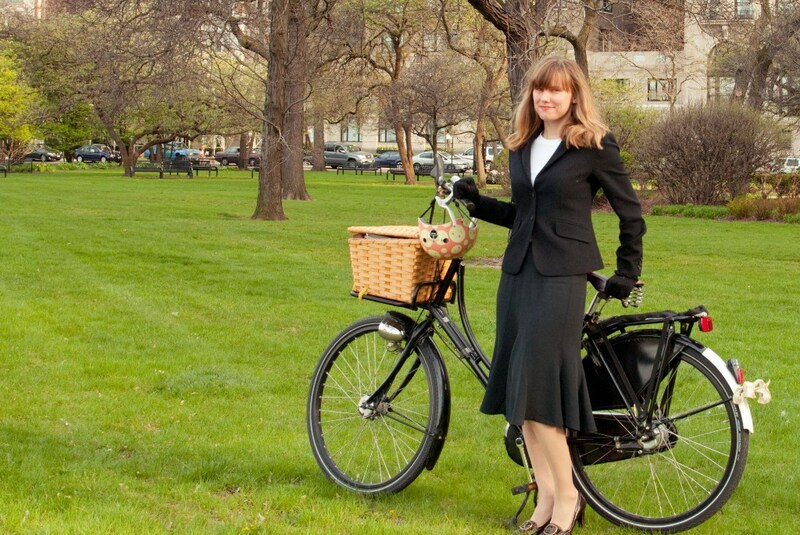 As you may have noticed, I enjoy wearing skirts and dresses, which means that I often cycle in skirts and dresses. Last summer, I posted about cycling in a long dress on a bike with a chainguard and soon made a part II video on a “regular” bike with no chainguard. In both cases, I was wearing ankle length dresses and had to be careful that the hem would not catch in the chain. Recently, I found myself wanting to wear a new long(ish) skirt on my regular bike. This skirt stops about 6 inches above my ankle. I thought I would have to gather the skirt to keep it from the chain and back wheel, but discovered that the skirt hem stayed far from those danger zones once I’m up on the saddle. I made a quick video to demonstrate how easy bicycling in this long skirt can be – no special accessories or preparation needed. Bicycling in a Long(ish) Skirt from LGRAB on Vimeo. Do you have long(ish) skirts that you can cycle in with no problem? Like any red-blooded American woman, I have spent the last couple of years intrigued by the “dry shampoo” trend. Caught in the fantasy of a world where blowdrying one’s hair each day (OK, every other day, but still) is not a necessity, I cruised beauty blogs and drugstore clearance shelves to find this mythical product. Trying out half a dozen varieties left me with but one that actually worked, but it was prohibitively expensive. Then, somewhere online, I read a passing remark about how all this stuff was basically baby powder. I’ve used that in my hair before, but hate the smell. Then it occurred to me that baby powder was basically cornstarch. A lightbulb went off: I HAVE CORNSTARCH! I began Googling in earnest. That was about a year ago, and I’ve eventually cobbled together a dry shampoo formula that works incredibly well for me. It’s a lifesaver after a hot summer bike ride, and it is NOT $12/oz. Intrigued? Read on! We’re big believers in the fact that riding a bicycle doesn’t have to mean compromising style (and when we say style, we mean YOUR personal style, not any sort of catwalk ideal). So we’ve tried wearing just about everything in our closets on our bicycles, and have found that there are very few items that absolutely won’t work (or aren’t worth the trouble of hacking). Here’s our very short list. Pencil skirts (without slits)—the tight, hobbling skirt doesn’t allow enough freedom to pedal, unless you convert them. Bellbottoms or extremely long or loose pants—the flares can get caught in your chain or crank, and the extra material slapping against the chain case or frame as you pedal can be annoying. Of course, binding the pants at your ankles can fix this, but for simplicity’s sake we prefer to just go for an alternate pants style. Miniskirts—unless you don’t mind being known as the girl who flashes people on her way to work. 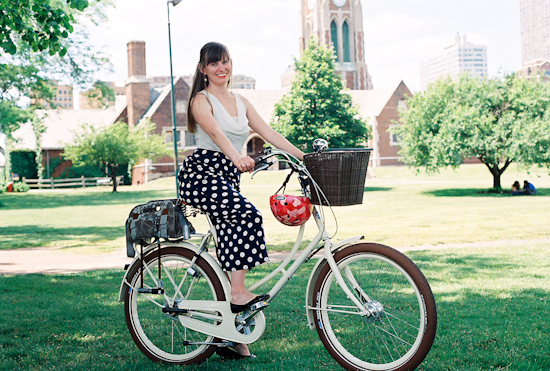 If you love miniskirts, try leggings, tights or bike shorts underneath, or get a big ol’ basket for the front. Evening gowns—this is as much a safety issue for the gown as it is for the individual! But long trains, gauzy overskirts, etc can be especially challenging on a bike. Platform heels—there just isn’t enough sole surface area at the ball of your foot to make contact with the pedal. Readers: where do you draw the line when it comes to bike-friendly clothing? Tell us in the comments! We get occasional emails from first-time or beginner cyclists, asking us for advice on conquering their fear of sharing the road. In the past, we’ve doled out bits and pieces of advice on this issue, but have never really consolidated it all into one step-by-step post for those who are just starting out on a bike. Here are my recommendations for how to become confident in sharing the road (just stop before you become one of those reckless bike messengers who are giving us all a bad name!). First: It’s homework time. If you don’t know the rules of the road, learn them! Learn how to signal a turn. Learn what your rights are in your city: is there a three-foot rule? Are you allowed to take the lane on all roads? Under what circumstances? Check out this hideously ugly but extremely informative site to find out what errors are most likely to lead to a car/bike accident, and do not make them! If there’s a bike safety class in your area, take it. Second: Get a helmet. I am not taking sides on the helmet debate here (please, Internet, I mean it), but studies show that if nothing else, they make you feel safer. This is important for beginners. Also, purchase lights, especially if you will be riding after dark. The brighter, the better. Use them. Third: Take your bike out! But don’t ride to work yet. Choose a greenway or bike path near your house, or a quiet side street, preferably with a bike lane. Any street with minimal traffic or some sort of separation from cars. If you absolutely do not have bike lanes or greenways or bike paths nearby . . . cry, and then write your city council or Congressperson. Or move. Or, for the less proactive/drastic personalities, just get up early on a weekend morning and ride. Guaranteed traffic-free! Don’t let the fear-mongering culture fool you—bike paths are a good thing! Once you have done all these things, and feel completely comfortable puttering around the neighborhood on two wheels, it’s time to try your commute—but not on a workday. Remember those magical weekend mornings when no one is driving? Pick one of them, and head to the office. (Painful, I know, but you don’t have to actually go in!) Google Maps has biking directions for most cities, and while they are not perfect, they’re a good jumping off point if you’re not sure what route to take. See how long the trip takes. Figure out how to deal with any complicated intersections or disappearing bike lanes. Find a place you can lock your bike near your office. If you didn’t feel comfortable on the ride, repeat this step, or alter the route to go around any spots that are keeping you from feeling comfortable. It’s OK to take the long way! Finally: Bike to work for the first time! Revel in your accomplishment, and enjoy your time in the fresh air. Feel, for once, that you have earned your happy hour beer. I know most of our readers are well beyond the beginner stage—what tips helped you build your bicycling confidence? Share in the comments. I heard so many great tips from commenters about u-lock schlepping last week. The one that takes the cake is from Jessie of Bicitoro, who posted an excellent tutorial for creating a u-lock holster from a leather belt. What a stylish, thrifty, and utilitarian solution! Check out her step-by-step instructions. If you create your own, please let us (and Jessie) know. Last month, I posted about bicycling in a long dress. I demonstrated using an upright Danish bike with a full chain case. Today I wore a long dress and I wanted to ride my Rivendell, which has an exposed chain and no skirt guard. I assume this is the type of bike that most readers have, so I’m posting Bicycling in a Long Dress: Part II – no chain guard edition. This is almost as simple as Part I. The only difference is that I pinned up the bottom of my skirt. Here is a quick video to show how quick and easy making a long skirt bike-friendly is. Has anyone else tried this with a long dress? I know a few of you commented about similar strategies in the previous post. 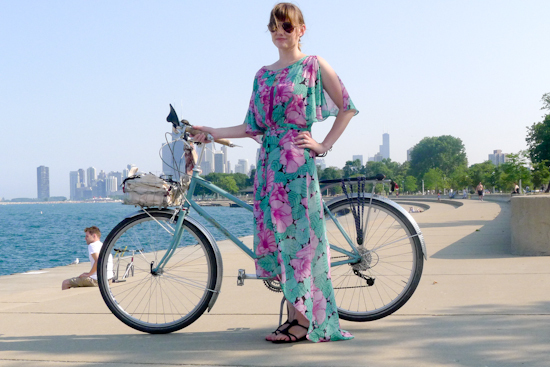 Bicycling in a long dress is possible! In fact, with the right set-up, it’s downright simple. Some may ask, “Why even bother biking in a long dress?” My response is that my bike is transportation and I do not want it to dictate what I wear (except pencil skirts, those are crazy – unless you convert it!). If you are interested in learning how, read on! Three major factors determine how successfully you can bike in a long dress: the dress, the bike, and the technique. Must allow enough freedom to move your legs in a cycling motion. The skirt needs to be relatively full or made of stretchy material with a slit, such as the one pictured above. Test the dress’s bike-ability before leaving (or purchasing) by doing some knee-lifts. Must have several characteristics to work with a long dress, unless you tie your dress up by your knees. First, a step-through frame (has anyone done this with a diamond frame??). Second, a covered chain to keep the skirt from being eaten and/or greased up. Third, a skirt guard if the skirt is full, so it won’t get pulled in the rear wheel spokes. Note that this was not an issue with the dress and bike above. Fourth, fenders, otherwise your skirt will rub against the rear tire. Finally, a clean frame is a good idea, since your dress will rub against it a fair bit. For the most part, you can bike as normal. You may benefit from hitching the skirt up a bit, to provide more give around the thighs. Experiment to determine what works best for each dress. You may also want to dismount fully at stoplights, to reduce stress on the seams of the skirt. Here is a quick video that covers the topic. I did this on the fly yesterday, since I happened to be wearing a long dress. I’m not a professional film-maker, so not the best quality video ever, but I hope simply seeing someone bike in a long dress is helpful. 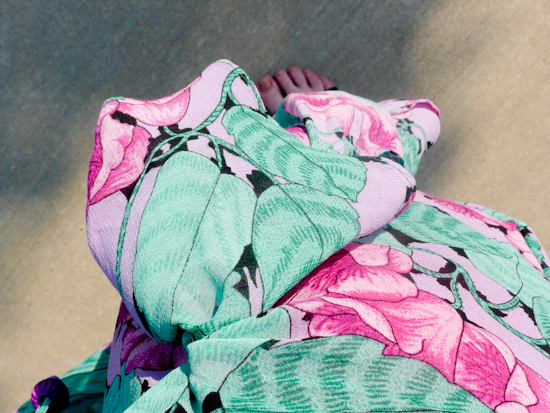 Have any of you biked in a long dress or skirt? I’d love to hear stories and additional tips in the comments! Please feel free also to share photos, via either html or links. We’ve been talking a lot about dealing with unruly skirts and dresses recently. I shared my experiences of tying my skirt and stapling my dress. To avoid such a faux pas in the future, I decided to wear my old Nike spandex shorts (no padding) under suspicious new dresses. Such was the case with a dress I thrifted last week (ahem, new with Nordstrom tags, I gotta brag). The skirt was full and the fabric light, making the dress a candidate for floating-up-with-the-wind syndrome, so I threw my spandex shorts underneath and thought I managed to be both clever and chic. I realized only when I got this film photo back from the lab that the outline of the shorts was totally visible under the dress fabric. *sigh* The dress never behaved inappropriately on the bike, anyway. Such is life, I suppose. This morning, I met up with my friend Elizabeth at Heritage Bikes for a quick breakfast before continuing on to work. Bikes and coffee and friends is a lovely way to start the day! While there, I met Sarah, one of Elizabeth’s high school friends visiting from Berkeley. She showed us her clever creation, a restrictive pencil skirt that she made bike-able by replacing the side seams with zippers and sewing in extra fabric. The surprise pop of color is so fun! At the office, you’re wearing a regular pencil skirt and then before getting on you bike at the end of the day, you unzip the sides and voila. Here’s a short demonstration video. Sarah has a website, Skirts on a Bike, where you can download instructions on how to convert your own skirt. She plans to start selling kits complete with zippers and fabric in the future. Has anyone else tried something like this? For summer rainstorms, a quick-drying outfit is more important than a good raincoat. Who wants to wear a coat when it’s so hot outside? The sweat and humidity is worse than the rain. Ick. I was wearing this outfit below last week when unexpected rain hit just as I left work. Five minutes into my ride, the rain stopped and the sun came out. I was pretty wet, not quite soaked, but by the time I got home 20 minutes later, I was completely dry. Very impressive quick-drying performance from my Patagonia skirt and top. I looked at the tag and they’re made of polyester. Boy, that fabric has come a long way since the 70’s. As I set out for work yesterday morning, a sprinkle turned into a downpour, soaking me. I had to wring out my shirt after I locked my bike. Unfortunately, I was wearing Lululemon yoga capri pants and top. Despite laying them out to dry all day, they were still damp (and mildewy) at the end of the day. Whatever fabric those are made of is good for yoga movement, terrible for bike commuting in the rain. I chose to wear my office skirt and blouse for the ride home. My shoes and riding gloves are still drying, too. I should stick to my Keen commuter sandals instead of regular sneakers for wet summer weather. Who else forgoes typical rain gear in the summer? What kinds of clothes and accessories have you found best for quick-drying? One of my favorite features on the Abici (commonly known as Kermit Allegra) is the coaster brake. It makes bike riding feel even more carefree and effortless. That said, they took a bit of getting used to. At first I would slow using the coaster brake, and then use the handbrake to make sure I could stop with the pedals in the correct position to start up again. Now, I almost never use the handbrake unless I need additional stopping power. Instead, when coming to a stop I nearly always brake by shifting most of my weight to my left leg, with the left pedal at an approximately 45-degree angle from the chain stay. Left foot is applying pressure to stop the bike. Remains on the pedal while bike is stopped. That leaves my right foot free to float off the pedal and down to the ground as I come to a stop. The right pedal is up and ready for me to push off when it’s time to start up again. My right foot touches the ground. The pedal is in the correct position for pushing off. If I know I need to make a quick start when the light turns, I will go ahead and put my right foot on the pedal and move my left foot to the ground, applying the handbrake to keep them in the correct position. How do you use your coaster brake? As winter glides along, I continue to enjoy the beauty of the snow and the invigorating freshness of the cold air. One thing that begins to feel oppressive about the season, however, is the heft of my usual winter wear. As I wrap the same wool scarf around my neck, pull the same clomping snow boots on, and zip the same puffy vest up for the hundredth time, I heave a bitter sigh. That’s when I know it’s time to get creative. If you’re getting tired of all the bulky accessories that go with winter cycling and are biking less because of it, please read on. A sleek and streamlined winter cycling outfit is possible, it only requires a bit more thought and care. Legs: The trick here is simple: two pairs of tights, a thick wool pair underneath a regular opaque pair. No one will know and it’s way warmer than a pair of jeans. Then you can simply wear whatever skirt or dress you want to wear. Feet: On top of the tights, a pair of thick wool socks. However, this alone is not enough for me, personally. Even with snow boots, my sensitive toes freeze quickly. The only solution I’ve found are toe warmers. With toe warmers, I’m free from both snow boots and freezing toes. I can wear fashionable boots for the first time since October! I get a lot of questions about the ones I’m wearing here – they’re from Nine West 5 years ago, not expensive at all. Torso: Once again, wool saves the day. A long-sleeved thin merino wool shirt, topped with a super thick wool cowl neck sweater. Add a wool caplet and done. No coat needed. But the trick here is a seriously thick wool sweater. Invest in a good one, by which I mean dig around in thrift shops for hours until you hit the jackpot. I bought the sweater pictured a decade ago and it’s still like new. I bought the hand-knit caplet from an Etsy crafter. Neck: Now you can leave the scarf at home – the cowl neck on the sweater can be pulled all the way up to cover the nose, if necessary. If you don’t have a cowl neck sweater, use your happiest and least itchy scarf. Ears: A wool winter hat takes care of the ears. Earmuffs would also be a good choice. Hands: Okay, I’m still stumped on this one, forced to wear ginormous ski mittens. I just took them off for the pictures. Like my toes, my fingers are susceptible to freezing. The great thing about cycling is that you can actually get away with a bit less clothing, since your body will create its own heat. This get-up might not keep me warm if I were standing at a bus stop, where it always seems like I’m waiting for an eternity, but it’s perfect for my bike ride. Of course, a lot about how I dress for winter cycling depends on how I’m feeling on a particular day. Sometimes I don’t give a care and end up in long johns and a puffy down coat. No shame in that! But when I feel the need to take it up a notch and escape the winter doldrums, I like to know that it’s possible, without leaving my bike at home. Any questions or tips of your own? Please leave them in the comments! Do you want to be as happy this winter as Mr. Snowman? Ride your bike! There’s nothing like spending time outside engaged in physical activity every day, enjoying the crisp air and scenery while everyone else hibernates. We won’t claim that winter cycling is always a big party, but it’s certainly not the nightmare scenario that most seem to imagine. As with any activity, knowledge is power: the more you understand about biking in the winter, the more comfortable you’ll be and the more you’ll enjoy yourself. As we enter our third winter of biking and blogging, our archives offer a wealth of information for new and experienced winter cyclists alike. Hence we bring you the LGRAB Guide to Winter Bicycling. What should I wear? A spacesuit or footie pajamas with ski goggles or what?? That’s the easiest question to answer: absolutely, but only if you can rock it. Otherwise, you may want to stick with your normal winter clothes. Once you see the basics of how to dress for winter cycling, you’ll say, “aha” and move on. You may even find that dressing for winter cycling can be effortlessly chic. Like all superheroes (be prepared: co-workers will call you that), you will have a weakness. For example, freezing fingers, but it is possible to keep hands toasty warm. Embrace your weakness and then overcome it. What about the awful weather? Rain, snow, wind, ice, freezing cold? Take it one day at a time. Some days fluffy snow creates a winter wonderland and bike paths are perfectly plowed. Other days the snow is dirty and nasty and in the bike lane. At the extremes, you may set out on your bike and then give up due to ice or extreme cold. No shame in trying! Your winter may consist of a lot of cold rain, but luckily women don’t get Jane-Bennet-ill from cold rain anymore, especially if you know what to wear. Just make sure that your brakes are in good shape. Then on the rare days when it snows, riding could be a fun adventure. If the weather on a particular day is really bad, simply choose not to ride that day. The most important thing is that you honestly differentiate reasons from excuses. Or maybe you live in Southern California. If so, #@!% you. I slip walking down the sidewalk. What chance do I have on a bicycle? A really good chance, actually. The roads, maintained by the city, are in much better condition than sidewalks. Once plows come by after a snow, main streets in the city are generally clear and dry. Depending on your city’s climate and your preference for sidestreets and bike trails, you may benefit from studded tires. Or if there’s just a bit of ice, you could simply walk your bike through the slick patch. Doesn’t it get old, riding in the dark all the time? Sometimes riding home from work in the dark everyday is a drag, but sometimes it makes everything seem quiet and calm. Just make sure you are cognizant of safety and security concerns and have good lights. I see you have fancy bikes. I don’t. So…? While our Dutch bikes (WorkCycles and Batavus) are great for winter riding, due to enclosed brakes and chains, a fancy bike is not necessary for winter riding. In fact, some people intentionally use old beaters for winter. Most bikes in good condition would make decent winter bikes, although some may require more caution and more maintenance. Be aware of what kind of brakes and tires you have and ride with caution in bad weather accordingly. If you have old steel rims, seriously consider replacing them. Decide whether you would benefit from studded tires. Remember that fenders are your friend and install some. If you plan to ride extensively in the winter, investing in a solid bike is worth it. Will I be the only crazy person out there? Maybe you’ll be the only bicyclist out there, maybe not. You may find and appreciate a whole winter cycling community or just enjoy the alone time. Even if there aren’t many other winter cyclists, you’re bound to meet colorful characters and bloodthirsty dogs simply by spending a lot of time outside. But can I really do it? If we did it, you can! For inspiration, check out a retrospective of the first winter biking. Is winter cycling a simple act or sheer will? Both! Hey, it’s really cold. Why am I doing this again? Because winter bicycling will change your life. You will better appreciate the differences between summer and winter cycling (for example, not smelling like B.O). You will feel the yin, the yang, etc. By season’s end, you will shed grateful tears over the first buds of spring, the first delicate bird’s nest. Also, for hot legs. Obviously. How can I verify that you’re not lying to me for kicks? You really can’t – welcome to the internet! But other resources are out there pretty much verify our advice. See, Bike Winter. Also, those other bike blogs listed to the right. The secret to bike commuting (hint: it’s not that bad). If you have questions or would like to leave your own winter bicycling tips, please share in the comments! Since I took public transportation instead of riding my bike during the two-day windstorm, I bring this story from my intrepid reporter/friend E A. If there’s ever a day when I don’t ride due to weather conditions, I can be 95% sure that E A rode anyway. With the gusty weather predictions for the Midwest and Chicago on Tuesday, I debated the safety of venturing out on two wheels for my morning commute. A high wind advisory and tornado watches had been alerting me all Monday evening and Tuesday morning about the potential dangerous weather that is plaguing many areas of the U.S. as October nears its end. At 7am Tuesday rain was pouring down and traffic reports showed the results of jack-knifed semis and cars in ditches. Luckily the worst of the storms moved over Chicago quickly and I found myself staring out into an eery calm after the storm by 8:30am. Shortly after 9am I was on the road with a light wind breaker for a dry commute into strong (but not gale force) southerly winds. Along my route, I bike down Wells Street – which to me is always ridden with cyclonic type winds – and my commute on Tuesday (or Wednesday) did not disappoint. Especially when the cross-winds come, I find it particularly challenging to keep my line and not be blown into parked cars or traffic speeding by. But I know my route well and that high level of familiarity helps me know just when and where I’m most exposed and where I can seek shelter or alternate transportation if need be. At least the these are the warm winds. It’s when these winds turn blustery that I start to shudder. Stay upright out there! And please share your stormy/windy commuting adventures and tips. This is not a full how-to video. I just made a quick little overview of me leaving for work yesterday while it was raining. Read our full rain how-to here. How do you ride in the rain? If the weather is hot, leave your tie, hosiery, jacket at work. If the weather is freezing, layer sensibly as I discuss here. If you wear pants, secure your cuff from hungry chains and crank arms, unless you want your fine Brooks Brothers suit ripped (sob). If you get hot while riding and want to remove your jacket, roll it before placing it in your pannier or basket to prevent wrinkling. Take it slow and steady. No need to race the yoga-pant and lycra crowd. If you follow these simple tips, riding in a suit will be a practical and simple course of action. As a bonus, you’ll find yourself sitting up straighter and feeling super dapper. An example of public perception: I attended my company’s Wellness Committee meeting this week to propose that we participate in Chicago’s Bike to Work Week (hosted by the Active Transportation Alliance) for the first time. (Challenge accepted, and I’m the Team Leader!) 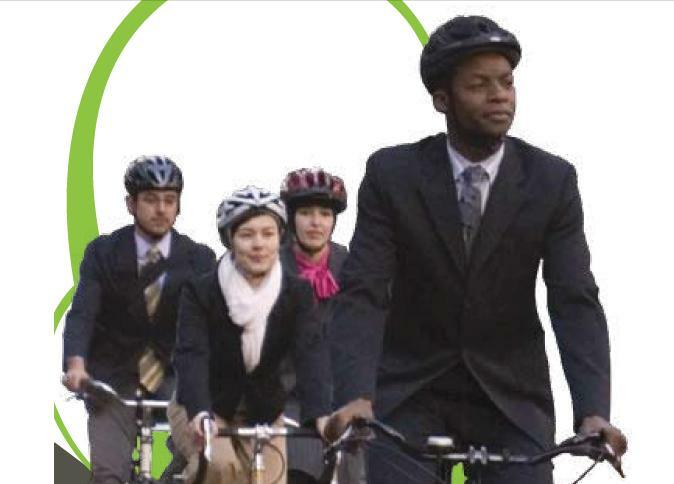 I passed around a flier advertising the ride and one of the young women immediately saw the picture below and cried out: “He’s riding a bike in a suit! Ha!” General tittering followed. I piped up that I often ride in suits. “Really?” “Yup.” End of story. Now at least all of us here know that riding a bike in a suit is not at all silly. If you want to try riding in your work clothes, have at it!